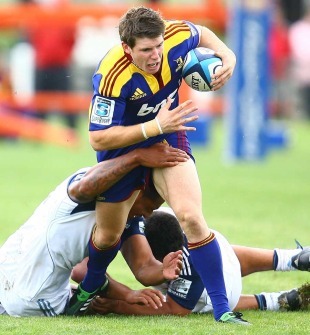 Highlanders fly-half Colin Slade is set to miss the first month of the Super Rugby season with a broken jaw. The All Blacks hopeful, who made his international bow last year, picked up the injury in the Highlanders' 31-29 defeat to the Blues in their pre-season clash in Balclutha. A subsequent x-ray confirmed the fracture and he underwent surgery on the injury today. It is estimated that the young playmaker, who made the switch from the Crusaders during the off-season, will be sidelined for six weeks. Slade is battling to be Dan Carter's back-up at the Rugby World Cup and he made a confident start to his Highlanders career at the AMP Showgrounds - playing a influential role before being replaced by Lima Sapoaga. The match was also Jamie Joseph's first game as Highlanders' head coach and he did not want to read too much into the loss. "I thought there were a lot of positives," Joseph said. "We achieved in the first half what we set out to do. In the second half we didn't achieve as much, but there was a bit less experience out there. It was important that everyone got a run today to get a taste of what Super rugby is like." The Highlanders kick off their Super Rugby campaign against the Hurricanes in Wellington on February 18.